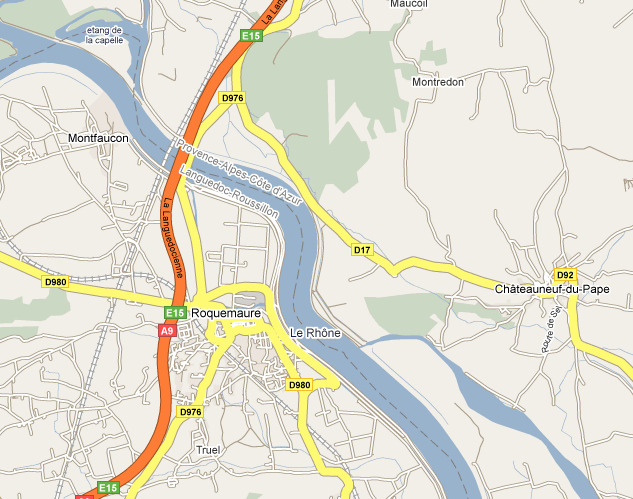 When driving to Montfaucon, plan to get a little bit lost. Mind you, there are worse places to be waylaid than in the Rhône Valley in late May, but after our fifth or sixth foray down another incorrect one-way street in the town of Roquemaure, my family and I were becoming a bit tense. 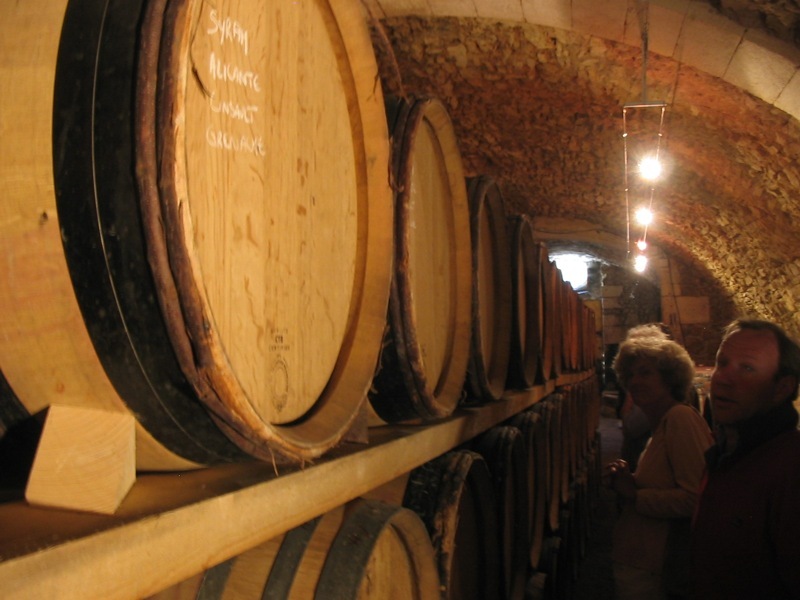 Nothing a little wine wouldn’t cure, however, and it wasn’t too long before we emerged from the labyrinthine mess and approached the tiny village of Montfaucon. 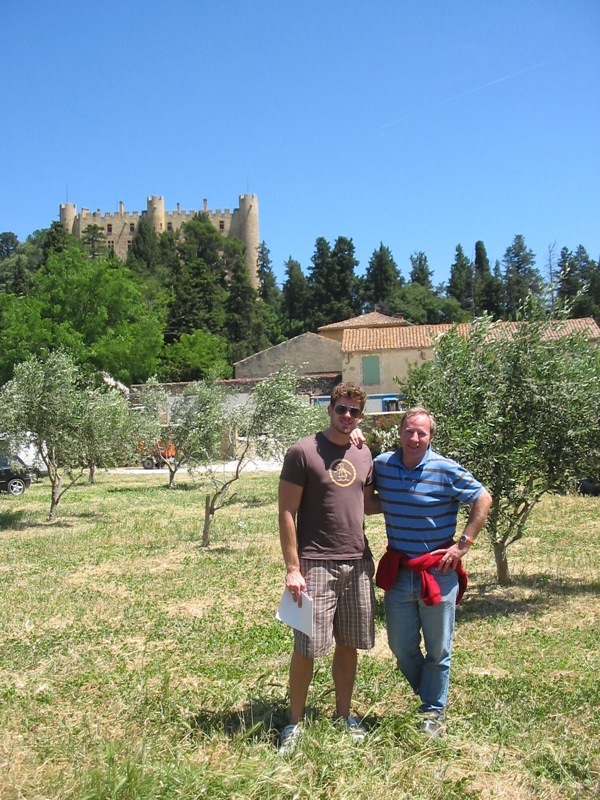 The eponymous 15th-century castle sits high upon a hill above the village and commands impressive panoramic views of the Châteauneuf-du-Pape region across the river; the castle is also where the de Pins family still make their home. 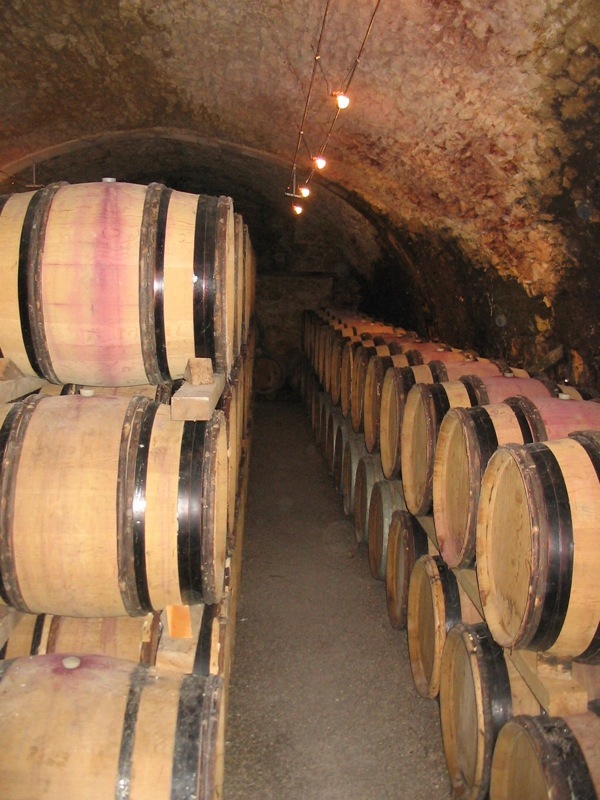 The original winery was built just below the castle, and is used today as an aging room. Rudi’s family acquired the property in 1766, and wine was made there in various quantities for the following two-hundred years. For much of the 20th century, the family was selling their estate grapes to co-ops, but Rudi had grander ambitions. 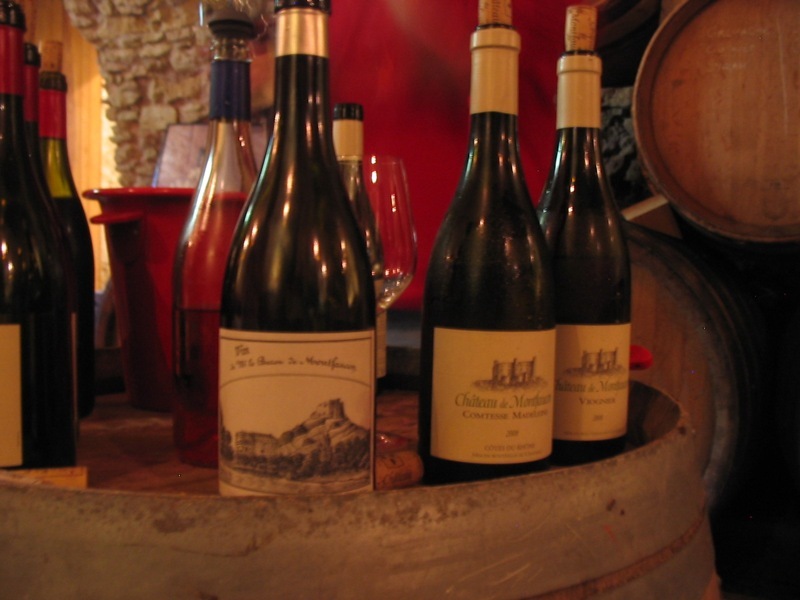 Following stints at UC Davis and at the vaulted Henschke Estate in Barossa, Rudi resurrected the Chateau de Montfaucon name and began production of his new lineup of Rhône wines in 1995. Rudi led us through a narrow doorway off of the tasting room and into the five-hundred-year-old aging cellar. The damp air smelled musty and stony, and gravel crunched underneath our feet. 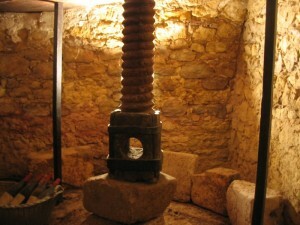 Rudi showed us the ancient grape press and described the old winemaking practices: grapes would come through a window into an open fermentation tank, and the juice would then be loaded by bucket into the barrels. We made our way down the rows of upcoming vintages as they slumbered silently in their casks, their exteriors marked with white chalk. 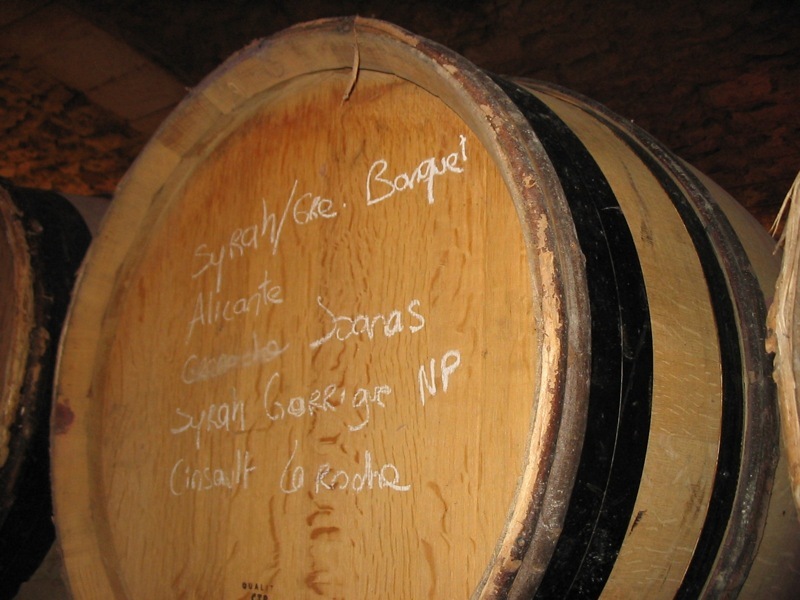 Finally, we arrived at an upturned barrel where an impromptu tasting would be conducted. Rudi started us off with a taste of the 2008 Chateau de Montfaucon Viognier (Vin de Pays), the only single-varietal wine in his lineup. Always a fan of the blend, Rudi chose to let the Viognier stand alone in order to highlight its natural freshness and vibrancy. With its floral notes of peach and tropical fruit, the nose had Viognier written all over it. The palate, however, had none of the plumpness I’ve sometimes encountered in new world bottlings; crisp and light, it served up gentle citrus flavors leading into a minerally finish. At this point, we were well onboard the train to red country, and the next stop was the 2007 Chateau de Montfaucon Côtes du Rhône, made of Grenache, Syrah, Cinsault and Carignan. This was a spicy little devil the whole way through: the nose offered up terrific white pepper notes, while the mid-bodied palate boasted flavors of brambles and bitter dark berries. A nice dose of acid bridged the gap to the long, spicy finish. As a point of comparison, Rudi opened a bottle of the 1998 Chateau de Montfaucon Côtes du Rhône, a vintage which he still sells for €12 in the tasting room. Visibly browning around the rim, the wine offered a dramatic departure from the tempestuous spices we’d tasted on the ’07. The earthy woodiness of the “brambles” were still there, but the wildness had subsided, leaving a well-integrated and almost delicate wine unlike any Côtes du Rhône I’ve ever tried at this price range. (Granted, I suppose it’s the first eleven-year-old Rhône I’ve tried, period.) The Montfaucon C.D.R. isn’t huge to begin with, and when given a chance to age, it really shows its placid side. If you’ve never had an “elegant” Côtes du Rhône before, get over to France and snag a ’98 before they’re all gone. The perennial flagship of the Montfaucon lineup is the Baron Louis red, named after the eponymous Baron who, in the late 19th century, restored the aging castle to its former glory. The 2006 Chateau de Montfaucon “Baron Louis” (Côtes du Rhône) is a blend of six grapes: Grenache, Syrah, Cinsault, Carignan, Counoise and Mourvedre, all from low-yielding lots (“under 30hl/ha,” according to the info sheet, and if I knew what either of those two abbreviations stood for, I’d probably be impressed). Baking chocolate made itself present on this nose, along with some brooding dark berry character — blueberry, perhaps? The palate followed suit, the fruit and chocolate notes bursting forth without any of the restraint of the previous bottles. The mouth-coating berry action was complimented nicely with some rocky minerality. Well-integrated like the others, the Baron proved more assertive in announcing the presence of its rich flavors. Really solid. We then had the pleasure of tasting the first-ever bottle of the 2007 Chateau de Montfaucon “Baron Louis” (Côtes du Rhône), fresh off the bottling line. “I think it’s a bit more charming,” Rudi told me. “The ’06 is more intense.” I agreed: many of the same flavors were there, but the wine felt smoother and less aggressive. 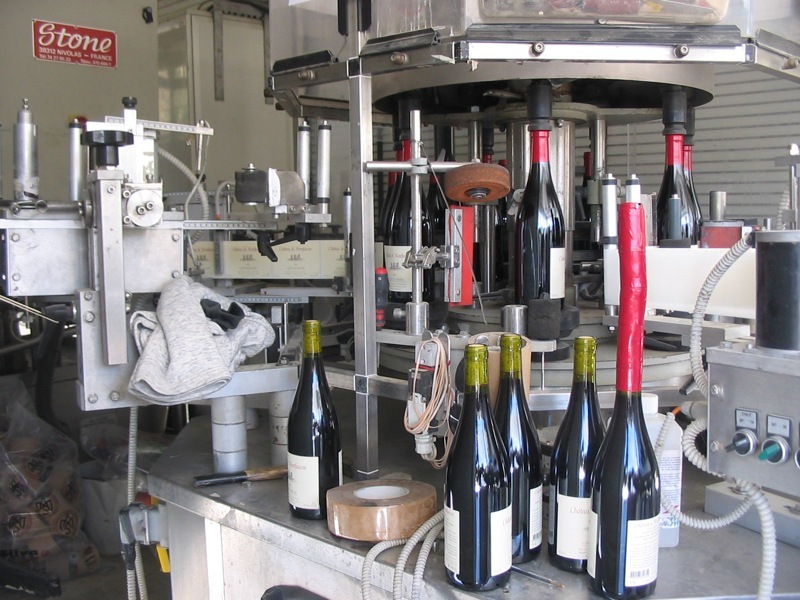 Several of the grapes in the Baron Louis blends are co-fermented, which Rudi feels is essential to achieving the integration and balance that characterize his offerings. 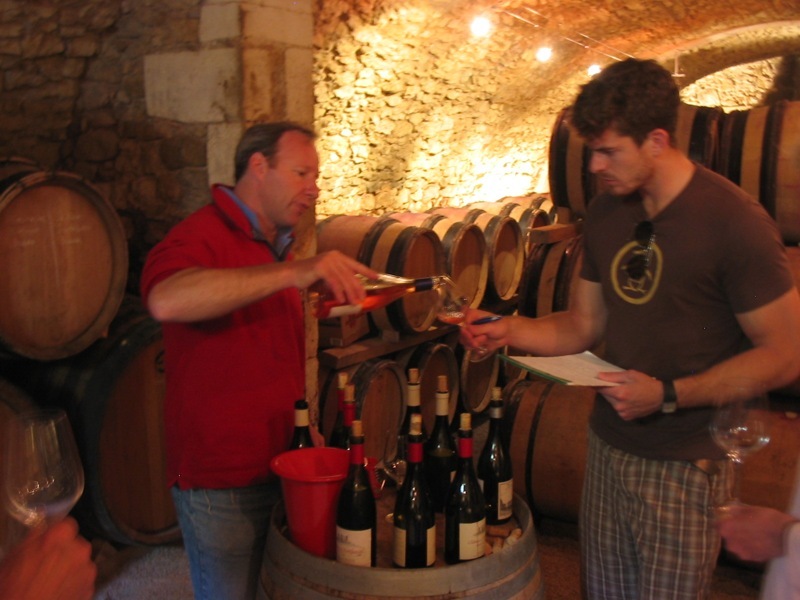 Balance was one of the characteristics lauded by Municipal Winemaker Dave Potter, a former Chateau de Montfaucon apprentice, when he shared a bottle of ’05 Baron Louis with us a year ago. 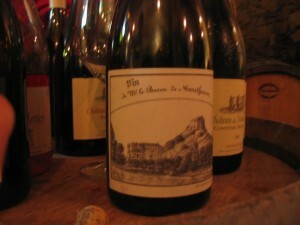 Nowhere is the blending mandate taken to such an extreme as in the newest and most prestigious entry in the Montfaucon lineup, the 2007 Chateau de Montfaucon “Vin de Monsieur le Baron” (Côtes du Rhône), a cuvée which includes all fifteen varietals growing on the estate — both red and white. Rudi was inspired to create such an unconventional blend after finding an original Montfaucon wine label from the 1820s. In those days, blends of red and white grapes were far more common, and Rudi has done his best to replicate what the original recipe may have been. The blend includes all of the grapes mentioned in this piece thus far, along with Muscat, Aubun, Alicante, and even Tempranillo. Befitting such a hybrid, the Monsieur boasted a bouquet that was both floral and spicy at the same time. The bottle had been open for a day, but the palate was very much alive, and the smooth flavors of dried fruit were almost unrealistically velvety in their expression. The Monsieur was an incredibly unique wine; not just in its conception, but in the glass as well. 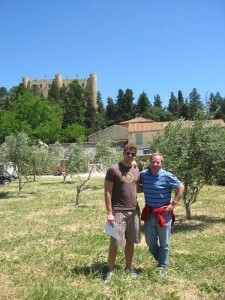 Following our tasting, Rudi took us to the courtyard behind the winery, where bottling was taking place. 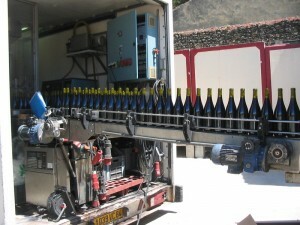 A mobile assembly line arrives by truck, and the bottles are shunted down from one trailer to another: filled, corked, and labeled. 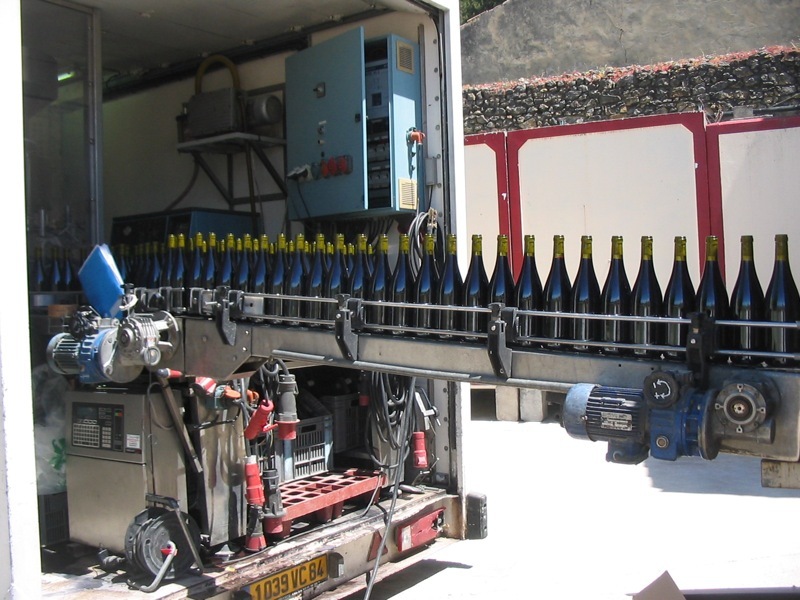 Upon completion of the Montfaucon order, the trucks will pack up and move on to their next winery. I would’ve happily hung out in the cellar all afternoon, but our itinerary beckoned, so we thanked Rudi for his time and made our exit. 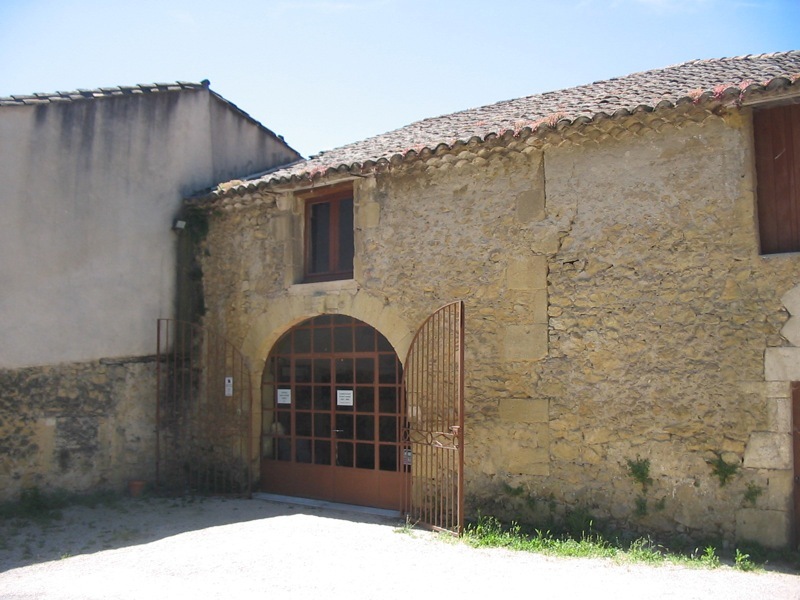 Chateau de Montfaucon is perhaps most impressive in the deft way it bridges the gap between a sense of approachable modernity and the age-old tradition of the small French wine producer. 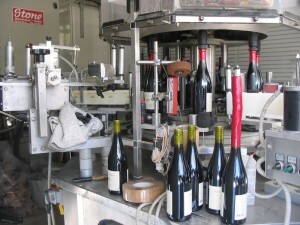 Its thorough English-language website and its friendly, multilingual tasting room might fool you into thinking you’re dealing with some kind of pre-packaged winery where tradition takes a back seat to tour busses; the sort of place where you can buy mini Eiffel Towers along with your varietally-labeled bottle. To meet Rodolphe de Pins and hear him speak so enthusiastically about his process, however — or even just to step into that five-hundred-year-old cellar and taste one of the small-production Montfaucon wines — is to understand the true nature of the Chateau, a place where time-honored traditions have been dusted off and allowed to shine. Next time you find yourself lost in the Rhône Valley, look for the castle on the hill, and get ready to taste some history.